Additional Info: Dr. Jeannine Jordan is a champion of the organ and its music. She has traveled through the US and the world promoting and sharing organ music through her concerts, workshops, and teaching. Her playing exhibits finesse appropriate to the years of academic training in organ performance yet is captivating in its use of 21st century technology. Her innovative performances delight the music-lover, educator, historian and organist of any age and make friends for the organ worldwide. Innovative, inspirational, creative, and enjoyable are the characteristics of Dr. Jordan's organ performances. She excels at bringing traditional organ music alive with the innovative sounds of today and tomorrow. 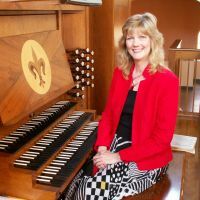 Her wide organ repertoire includes artfully played classical masterpieces, the glorious music of JS Bach, lesser-known early American music, and tastefully performed contemporary hymn arrangements. Concerts are creatively designed for each audience. In addition to solo concerts, Dr. Jordan and her media-artist husband, David, present two unique organ and media events, From Sea to Shining Sea and Bach and Sons. Both performances make use of not only visuals, but real-time camera projections of Dr. Jordan's playing.